A series of 51 5-HT2A partial agonistic arylethylamines (primary or benzylamines) from different structural classes (indoles, methoxybenzenes, quinazolinediones) was investigated by fragment regression analysis (FRA), docking and 3D-QSAR approaches. The data, pEC50 values and intrinsic activities (Emax) on rat arteries, show high variability of pEC50 from 4 to 10 and of Emax from 15 to 70%. FRA indicates which substructures affect potency or intrinsic activity. The high contribution of halogens in para position of phenethylamines to pEC50 points to a specific hydrophobic pocket. Other results suggest the significance of hydrogen bonds of the aryl moiety for activation and the contrary effect of benzyl groups on affinity (increasing) and intrinsic activity (decreasing). Results from fragment regression and data on all available mutants were considered to derive a common binding site at the rat 5-HT2A receptor. 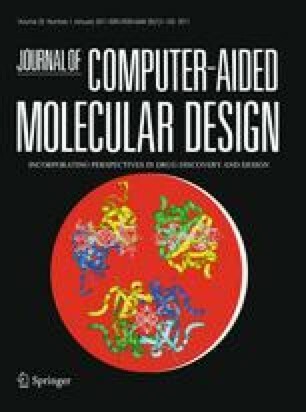 After generation and MD simulations of a receptor model based on the β2-adrenoceptor structure, typical derivatives were docked, leading to the suggestion of common interactions, e.g., with serines in TM3 and TM5 and with a cluster of aromatic amino acids in TM5 and TM6. The whole series was aligned by docking and minimization of the complexes. The pEC50 values correlate well with Sybyl docking energies and hydrophobicity of the aryl moieties. With this alignment, CoMFA and CoMSIA approaches based on a training set of 36 and a test set of 15 compounds were performed. The correlation of pEC50 with steric, electrostatic, hydrophobic and H-bond acceptor fields resulted in sufficient fit (q 2: 0.75–0.8, r 2: 0.92–0.95) and predictive power (r pred 2 : 0.85–0.88). The important interaction regions largely reflect the patterns provided by the putative binding site. In particular, the fit of the aryl moieties and benzyl substituents to two hydrophobic pockets is evident. This work was supported by the Graduate Training Program (Graduiertenkolleg) GRK 760, “Medicinal Chemistry: Molecular Recognition - Ligand-Receptor Interactions”, of the Deutsche Forschungsgemeinschaft.